It's 12:45 a.m., and my kitchen counter is splattered with the sweet juice of pounds of Bing cherries. I hope my neighbors can't see in, because it looks as if I've just chopped up a murder victim. And I have the crazed look in my eye of a killer; it's my third batch of jam of the night, and I still want to get the kitchen cleaned up so tomorrow's berry-picking bounty will be easy to process. I am tired, but I press on, exulting when I get the proportions just right. I'm making jam without sugar, and my first batch of cherry-honey jam is marked with "super sweet" on the lid, and I don't really know what I'm going to do with those six neatly sealed half-pint jars. Perhaps it should be "honey-cherry jam." I was replacing 6 cups of sugar from my recipe, and thought 2 cups of honey might do. The resulting purple spread was so cloying I almost choked. Now it's nearly 2 a.m., and I wonder if I shouldn't start a batch of honey wine, but a crying, hungry baby finally gets me in bed. I take Linda Amendt's Blue Ribbon Preserves book to bed with me, thinking I'll mark a few ideas for the strawberries I'll be bringing home in the morning. I dream of lifting jars out of hot water baths. I dream of state-fair ribbons. I dream of a chest freezer. I'm thoroughly crazy. The next day, my sister, my three boys, and I head out to 242nd Avenue, to Thompson Farms. The place comes highly recommended by a few friends, and the enthusiasm of the farmer who gives the "crop report" on the answering machine every day is palpable. They never spray insecticides or herbicides, and their prices are fabulous — $1 per pound for U-pick. 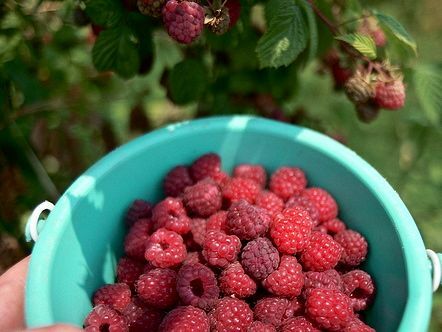 Today's crop update isn't what I'd hoped, as the recording says the berries are somewhat picked over — but it mentions raspberries, available for the first time this season. We get to the field around noon, and I strap Monroe in his baby carrier and hand off buckets to the boys. I've weighed the buckets at home, writing the tare weight on them to make checkout easier, and we get to work. The fields aren't as verdant as the ones I remember from my youth (as a pre-teen in Portland, I picked berries at a piece rate with one of my little sisters and my just-younger brother, whose proceeds often tripled mine at the end of those hot days); they're rather more dirt than berry plants, and Truman just wants to run around. But after about an hour, we've amassed 12 pounds of strawberries, and we head to the raspberry field about two miles away. We must be one of the first to arrive at the raspberry rows. 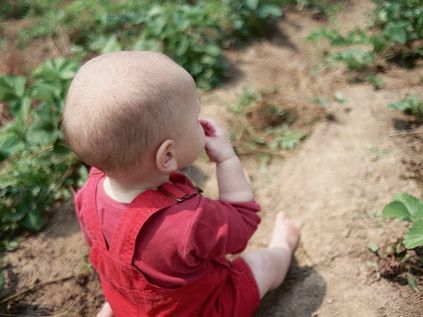 They seem sleepy and untouched; we must push away weeds and grasses to reach the gobs of fat, bright-colored berries. Compared to the strawberry plants, these are the frontier of berry-picking. I cannot help but feel spoiled, looking over my shoulder to see if someone else might dart up to steal away the riches of these prickly vines. We would pick for hours, but we have Things To Do, an appointment to make, and we must pay and go. As I leave, I let Everett talk me into a big carton of apricots I know he won't end up eating. That night, as I try to put into practice some of the things we've discussed in our couples counseling, what I really want to be doing is making jam. I have read comments on Harriet's latest post and I have two books open on the kitchen counter. Here is the thing about me: I am able to hold many conflicting values and desires at once. Perhaps it is mania. Perhaps it is a pointless striving toward an unattainable (and ever-changing) perfection. Perhaps it is a heroine's quest, a design that is as stunning in its nobility as it is in its difficulty. Perhaps. 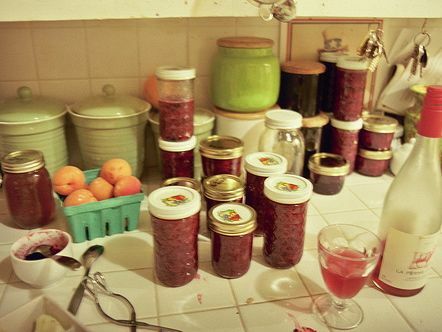 I know that this is what I must do: I must have jam, made with locally obtained ingredients, unsullied by chemicals, entirely without sugar, and as Linda Amendt reminds me on nearly every page, I must make that jam within hours of harvesting. If not sooner. The baby cries and I must send out a report still; I am exhausted. I fall into bed, covering buckets of berries with a towel. As I nurse Monroe, yearning wildly for sleep to overtake me, I remember keenly reading the tomato-canning chapter in Barbara Kingsolver's Animal, Vegetable, Miracle (the book that started this all). I remember how manic she seemed, how she remarked upon how her ambition had got the best of her with the tomatoes. I remember how I thought, reading that, "This wouldn't be me! I would be so much more under control, I would welcome all those tomatoes! I would exult in that preserving marathon!" and how I knew somewhere under my sheen of self-satisfaction that Barbara's mania would have nothing on mine one day. If anyone can out-exceed Barbara Kingsolver, it's me. The next night, my husband needs my attention, and so it is two days after harvest before I make jam. I now have cherries, strawberries, raspberries, and apricots; I am out of Pomona pectin (and also out of money), so I have cooked a pint of currants with a few cups of water and strained it to make a natural pectin. I have grown confident from my strawberry-raspberry-blueberry-cherry jam, delicious beyond measure, made without measuring (I just poured a liberal swig of wildflower honey, somewhere around 1/2 cup) and I have decided I will embrace extempore. I make batch after batch, each one less precise than the one before, the small-batch way where I cook the berries in a deep wide pot until they jell a bit on a chilled plate. Strawberries and currants and honey make a delightful, if soupy, jam, and the raspberry jam made with a little rapadura is so pure and lovely, I am transported back to Thompson Farms as I lick every last bit from the jam pot, standing in my sticky kitchen. I am running out of ingredients by my last batch, so it is cherries and apricots and currant juice and honey, and I declare it my best yet! Amazing! Unbeatable! I wonder if I can enter it in the Oregon State Fair. I say "jam" to myself in other languages to pay its rightful homage. "Confiture," I whisper. "Marmelatta." Every night that I make jam, I line up my pint jars on the edge of the counter before I fall asleep so that I can awake and gaze at them, perhaps pick one to open to spread on my toast or pancakes or waffles. I honor each jar, I caress the top where it's sealed, pop pop pop, I tip them this way and that to watch the many colors of fruit spark in the light, to assess if this jam is thick, or thin, to imagine how it will be in September, November, February. I know that my Thanksgiving pies, my Christmas linzer cookies, my gray January breakfast biscuits will take me back to July, to August, to this heat and abundance and the pressure to savor it all for the winter to come. I know that as I swim inexpertly through this never-ending cascade, the rows and rows of pints of blueberries, cherries, and raspberries at every farmers' market, as I gasp for breath trying to keep my head above the spoilage, as I flail wildly to commit the sparkling sweet strawberries to their rightful place in my pantry, I will never quite manage to stay afloat. But I will eat every day better than I have all my life until now, this year, this preserving summer.